Sarah’s husband David has been dead (killed in flash flood) for three months when she sees him in a grocery store. Then she starts meeting him more often – even talking to him and letting him make her ham sandwiches. Is he ghost? Did he fake his death? Or is Sarah creating an elaborate alternate reality in her head to deal with his passing? Not only does this novel present the reader with the engaging mystery of David’s existence – or lack thereof – it also presents a searing portrait of a marriage that had grown stagnant, a cage for both Sarah and David. It’s a great psychological exploration of grief, marriage, and the mysteries of life. I found myself thinking about it a lot, even when my attention was supposed to be on other tasks. I especially liked the dynamic between Sarah and David’s dashing brother Nate. The widow’s group also added a nice spark to the story. And of course I can’t forget Sarah’s cat Grace. She seemed very comforting and sweet. Would be perfect for book clubs. 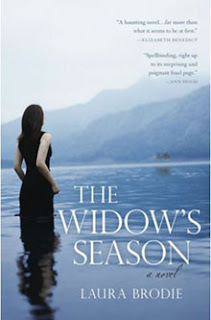 THE WIDOW’S SEASON is available in paperback now. Find out more about it on the author’s website. This sounds really good! Julie (Booking Mama) sent me her copy of this book, and hopefully I'll get to it soon. This one is on my list of books that I really want to read. Thanks for your great review of this one! This book sounds fascinating! Definitely the sort of thing I've been looking for lately. Thanks for the review! I am loving the cover! Sounds fascinating and thought-provoking, but perhaps a little too serious for me right now. I really liked THE WIDOW"S SEASON. The mind games frustrated me at times, but that must reflect my need to be in control -- it was very well written! Laura Brodie is publishing a memoir about the year she home-schooled her daughter; I think that will be a great read, too. I have had this book on my shelves for quite some time now (I know, I am shamed) and have every intention of reading it. I like mind games and ghostist stories, I just have to make it a priority!!! This was one of my favorite books of 2009. I thought it was so beautiful. I'm so glad you liked it, too! Love the cover of this book! I think I might give this book a try. Sounds intriguing.. The plot of this book sounds mesmerizing to me and I really want to read it. I love that you loved it and gave it such a thoughtful and insightful review. I love how you describe their marriage as being like a cage. Awesome visual imagery! I've had this book on my to-read list for a while, but completely forgot about it. Thanks for the reminder that I need read this one soon! I really liked the psychological aspect of this book. I didn't care too much for Nate and his involvement in the story, but it didn't stop me from enjoying the book. I have this one on my shelves. Looks good. This looks great! I just put in a request for it. Dystopian February Survey & 3 Mega Prize Packs!